Maradona won the World Cup with Argentina in 1986 and reached the final in 1990. Diego Maradona has plastic surgery on his face after getting bitten by one of his dogs. Maradona will be discharged on Tuesday, hospital spokesperson tells CNN. Maradona will lead Argentina at the World Cup finals in South Africa in June. (CNN) -- Argentina football coach Diego Maradona has undergone plastic surgery on his face after being bitten by one of his dogs. The 49-year-old was admitted to the Sanatorio Los Arcos clinic in Buenos Aires on Monday after suffering an injury to his top lip, hospital spokesperson Izarriaga Facundo told CNN. He is doing well after undergoing reconstructive surgery last night and will be discharged later on Tuesday, the spokesperson added. 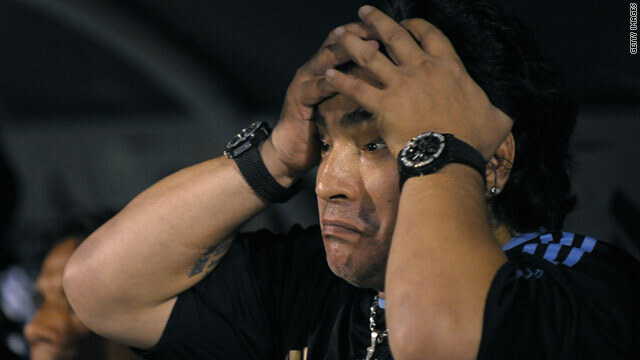 Maradona spent several weeks in the same clinic in 2007 after developing serious health problems. Is Messi better than Maradona? His career has been interspersed with moments of glory and controversy. In 1986 he scored an infamous "Hand of God" goal against England on the way to inspiring Argentina to World Cup victory. He was suspended from football for 15 months in 1991 after failing a doping test for cocaine while playing for Napoli in Italy, and was sent home from the 1994 World Cup in the U.S. for using ephedrine. Since retiring from playing aged 37, he has battled several health problems related to his weight, drugs and alcohol. Maradona's Argentina side made a disappointing start to their World Cup campaign before qualifying for the finals in South Africa via a late goal against Uruguay in their last game in October. Following the victory, Maradona unleashed an obscene tirade at journalists and was banned for two months.